Alongside the handful of responses of “We don’t celebrate that holiday in my country,” there were several colorful accounts of dyeing eggs using onion skins and decorating them with stencils, blowing out raw eggs to make ornaments from the empty shells, participating in religious processions and church services during Holy Week, hunting Easter eggs in the yard (or inside the house if there’s still too much snow on the ground—as is apparently sometimes the case in Norway), and—of course—the Easter morning delivery of chocolate. When it was my turn to speak about American traditions, I talked about decorating eggs and hunting them. I even explained the White House Easter Egg Roll. Of course, I also talked about waking up to chocolate and candy on Easter morning but—perhaps surprisingly for you—I was the only student who gave credit to a magical bunny. Now, from what I understand, the rabbit (like the egg) has a long, pagan history as a symbol of spring, rebirth, and fecundity. As a symbol of Easter, it seems to trace its origins more specifically to either Alsace or Saxony, from where it eventually made its way to America thanks to 18th century German immigrants. My German classmate did mention the tradition of children wearing rabbit ears during an Easter race, but it seemed that the rabbit as chocolate deliveryman was kind of an American thing. 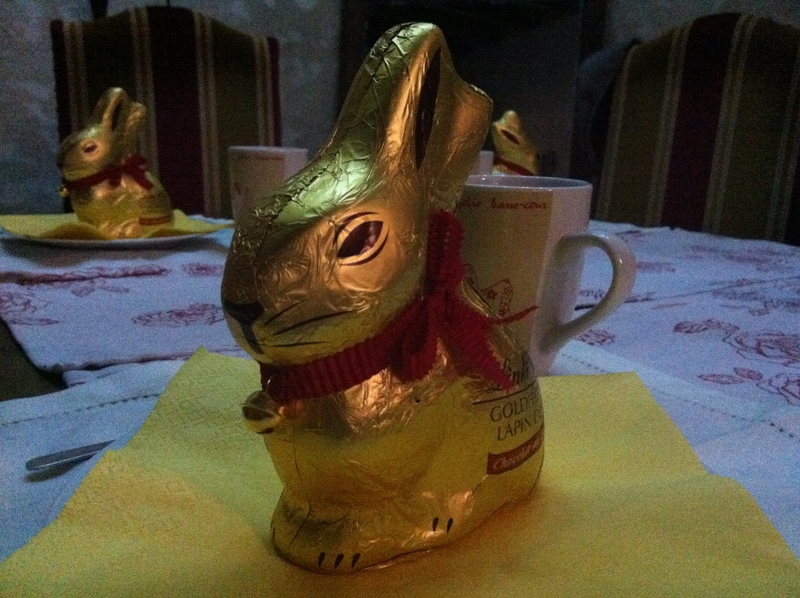 The highlight of this morning’s discussion, though, was when I introduced my classmates to the French tradition of Easter chocolate delivery: the bells that fly in from Rome. “Flying bells?” you ask. 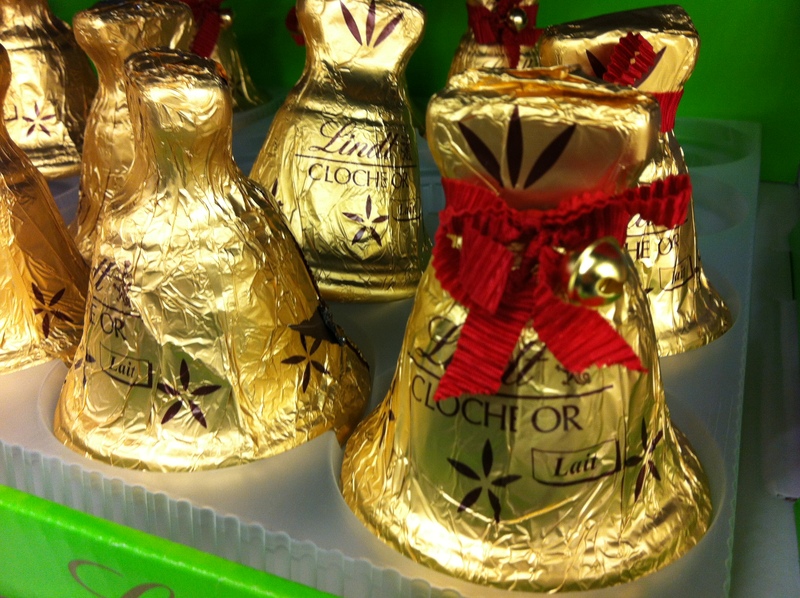 Yes, you heard that right: bells, as in “ding dong,” that apparently get clearance to fly from Leonardo da Vinci Airport to Charles de Gaulle on Easter morning and then make the rounds dropping off chocolate all over France. This unique tradition apparently developed as a way to explain to French children why church bells are silent between Good Friday and Easter morning. So the story goes, the bells go to Rome to be blessed by the Pope, and when they come back from the Vatican, they bring goodies for the kids! Our class discussion this morning reminded me of the American humorist David Sedaris, who wrote about a very similar exchange when he was a French language student years ago in Paris. Check out the clip below. I guarantee you’ll laugh out loud. as the case may be — bring you all the chocolate you can eat! We have bunnies in the U.K. too. And I was also just as bemused as you about the flying bells! Too bad we didn’t have an English student in our class! I’m often depended upon for the “Anglo-Saxon perspective.” It’s a big responsibility. As for the bells, yep, I’m pretty sure that’s a French thing. I doubt the Italians even have that tradition! Hope you’re enjoying the blog. Bienvenue! Same for me – it can sometimes be a hard task to always be an unofficial Anglo-Saxon Cultural and Linguistic Ambassador!